Arlene Foster was born in 1970. That was the year Ian Paisley was first elected to the House of Commons, arguing that ordinary unionists needed a voice other than ‘big house Ulster Unionists and big house Tories to represent them’. It was the year when Edward Heath became prime minister – the last government when Ulster Unionists were in receipt of the Conservative whip. His was also the last government in which a unionist from Northern Ireland (Robin Chichester-Clark, MP for Londonderry) held ministerial office. Within the next two or three days, Foster, whose own political future was under scrutiny and doubt just a few months ago, will decide Theresa May’s immediate future. It’s no surprise that May should be talking to the DUP. The relationship between the parties has been fairly comfortable for a number of years. In January 2010, the DUP and UUP (with whom the Conservatives had struck a deal and created Ulster Conservatives and Unionist: New Force – better known as UCUNF) met with the Conservatives at Hatfield House to discuss the possibility of a broader alliance in the run-up to the general election. Those talks broke down, but the UUP’s failure to win any seats at the election meant that any future overtures would be focused on the DUP. Not much was required from the DUP after David Cameron struck a deal with Nick Clegg between 2010-15 (although doors were kept open); but Cameron’s small majority in 2015 and May’s perceived weakness when she replaced him, meant that there was already a nod-and-wink understanding between both parties. That sort of very informal understanding won’t be enough to prop up May for just the next few months – let alone for a year or so – so it is inevitable that she would want something more solid. And given the fact that the DUP despises Jeremy Corbyn and want to hold off on a second election for as long as possible, it’s no surprise that they will help May as much as they can. But both Foster and May need to exercise extreme caution. There is no guarantee that May will even survive as leader for a few months, so Foster needs an assurance that anything she wants is deliverable fairly quickly. She’ll be aware that May’s successor – who could be in place much sooner than anyone expects – will also need DUP support to survive until the next general election; so she won’t want to agree anything with May that could prove ‘difficult’ for that successor. 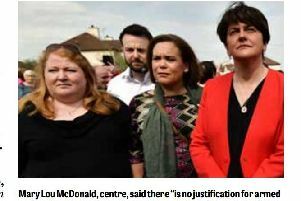 May needs to be careful that the DUP’s ‘image’ doesn’t damage the Conservatives’ image: or, at the very least, doesn’t damage it any more than she herself seems to have damaged it in the last two months. One of the reasons the Conservatives struck the UCUNF deal with the UUP in 2009/10 – even though the UUP had only one seat, the anti-Conservative Lady Hermon – was because they believed that the UUP was, ‘more civilised, more progressive and more liberal than the DUP’. I’m pretty sure that a substantial number of Conservative backbenchers remain of that view. And judging by the reaction of mainstream media (left and right, as it happens) and social media across Great Britain, the DUP’s ‘image’ problem isn’t just restricted to those Conservative backbenchers. That said, I think Foster is right to try and strike a deal. Any other party leader with a broadly similar outlook on constitutional issues would have opened negotiations at this moment. It doesn’t mean that a deal is possible, but it would be foolish to reject one out of hand. She has cards to play at this point: and so long as she doesn’t play a foolish, entirely self-interested hand, it makes sense to play them. Northern Ireland has socio/economic problems and she is right to press her present advantage. The SDLP would be talking to Corbyn if they had seats. Sinn Fein would be talking to Corbyn if they took their seats. The UUP would be talking to May if they had kept their seats. The SNP will talk to Corbyn about the prospects of a minority government. The Lib-Dems would talk to anyone. The DUP is trying to reboot an Executive with SF – so why would it balk at talking to May and constructing a deal at Westminster? I’d be surprised if the present talks end with a formal coalition: partly because there is still too much uncertainty over May’s future, but also because the DUP won’t want to get caught in any electoral backlash (especially if there’s another Assembly election in October) if May has to make difficult, unpopular decisions. I also think key figures in the DUP will be wary of doing anything that would force SF out of the Assembly; which is what a formal coalition might do. So yes, they’ll press their advantage (probably in the form of cash injections, project funding and Brexit protections for NI etc), but they certainly won’t press it to the point of damaging themselves too much with a potential Corbyn government further down the line; nor to the point of risking the survival of the Assembly. Politics is about dealing with existing circumstances. When May called the election the general view was that she’d return with a whopping majority and no need for any sort of understanding with the DUP. On Thursday, Foster landed on her feet, both here and in Westminster. So it was inevitable that talks would begin within hours. I don’t think May will last for long; and I don’t think a second election can be avoided for long, either. The electorate delivered a hung Parliament. It’s up to the parties to make what they can of that brutal reality.